Mercator has over twenty years experience in the freight forwarding business and has imported various supercars and luxury cars into the UK from all over the Middle East including Dubai, Saudi Arabia and Kuwait. Let Mercator guide you through the process of importing your supercar into the UK with a comprehensive, personal service. Our experienced team of freight forwarders can advise on all matters including transit methods (i.e. sea freight or air freight), transit times, options to securely fasten the car in its shipping container, import VAT and duty, and loading options. We understand that the safety of your vehicle is paramount, and so will go to lengths to ensure that the car is secured safely in its shipping container, or on the airplane. Fastening will only be undertaken in full knowledge that no marks will be made to the car. Options such as using webbing and padded straps can be discussed. Mercator can organise everything for your shipment of your supercar from its destination in the Middle East. We can arrange the sea or air freight, the collection of the car when it arrives into the UK for delivery anywhere across the country, the import VAT and duty payable upon arrival in the UK, and all measures to ensure a safe transit. 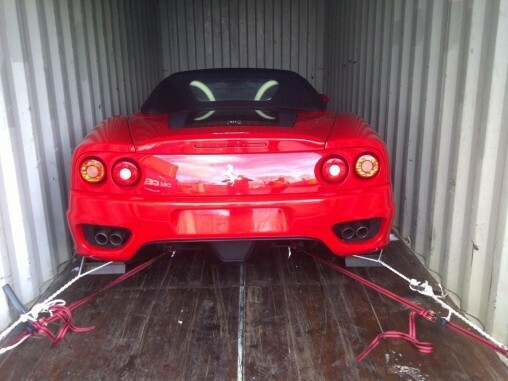 The Ferrari above is a car that we shipped for a customer. As you can see, it has been containerised in order to minimise the risk of damage in transit and has been secured in the container to ensure that it does not move around during transit. We have contacts at most ports who can arrange the secure loading of your car, do a full inspection before the vehicle is loaded and ensure the car is securely fastened into the container for transit. If you’re looking to import a supercar from Dubai, Saudi Arabia or Kuwait, contact us today to see how we can help – Tel. 02392 756 575. Email: sales@mercatorcargo.co.uk.